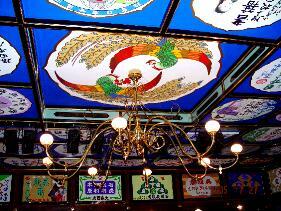 The Yachiyoza Theater was built with the support of the Yamaga Chamber of Commerce and Industry in 1910. At that time,Yamaga was prosperous as a center of commerce and industry in the northern area of Kumamoto Prefecture.and was famed for its hot springs throughout Japan. The Theater was built for two reasons,the first of which was the desire of the people of the Chamber of Commerce and Industry to invite their clients out to express their appreciation . And the second points was the high interest shown by the people of Yamaga in popular culture of all types, including the theater. The Yachiyoza Theater opened in 1911, presenting a kabuki drama peformed by the Matsushimaya Famiry. The paerformance created a sensation throughout the town. The Yachiyoza reached peak of its popularity in the latter half of the Taisyo(1912-1925) and the early Showa(1926-1988)eras. In the Taisyo era, other forms of entertainment such as silent movies and naniwa-bushi recitals also became popular, joining tarditional theater and kabuki drama. 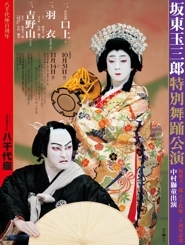 In paticular, the kabuki drama performed by women proved extremely popular with the people of Yamaga. in1917, Tolstoy's "Resurrection" was performed, and a song from the play became a super hit. In the Showa era, the Yachiyoza Theater began to offer a variety of events; lectures, composite plays where actors performed on stage against images projectted on the screen, and competitions for judo,sumo wrestling and boxing. With the end of World War Ⅱ in 1945,violin recitals and ballet performances were held., inviting famous artists from across the nation. Between 1955 and 1964, the movie industry was in its most vigorous period, and countless movies were screened at the Yachiyoza Theater. Yachiyoza Theater was used until the early 1970, but then closed due to the continued decline in business. Closed and without maintenance, the Yachiyoza Theater gradually decayed, and was on the verge of being demolished. Around 1980, however, a grass-roots movement emerged among the residents to preserve the Yachiyoza Theater for the next generation. They conducted a fund-rising campaign, and took the first step toward full restoration by repairing the leaky roof. On December 19, 1988 , the Yachiyoza Theater was designated aｓ a national important cultural asset, the third theater to be so honored in japan. Since 1990, regular performances by Bando Tamasaburo, the famous kabuki actor, have attracted many tourists from throughout Japan. Copyright (C) 2001 YamagaCity chiikisinkoukousya All Rights Reserved.